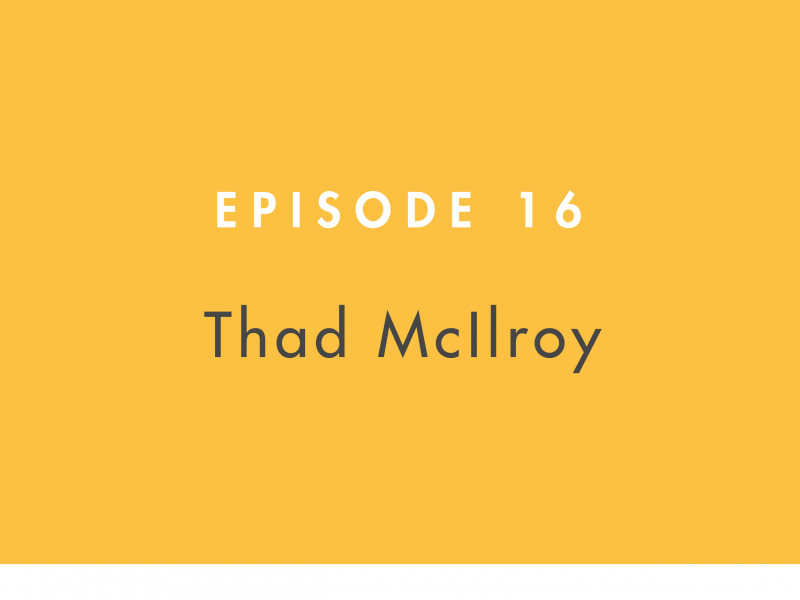 The Building Books podcast is excited to welcome Thad McIlroy, publishing expert, futurist, and author. With his extensive experience as an electronic publishing analyst, consultant, and author that explores technology and marketing issues surrounding electronic publishing, he brings an interesting and thought-provoking perspective to the publishing discussion. Combining their wide range of experiences in the industry, Yeffeth and McIlroy walk through the complexly progressive world of publishing and technology, even making comparisons with the television and music industries and their progressions through time and technology. Listen in for an eye-opening perspective on where the publishing industry has been in regard to technology and growth, where it is currently, and where McIlroy sees it headed in the future. From eBooks to self-publishing to the future of Barnes & Noble, it is all discussed here. This is one episode you can’t afford to miss! Thad McIlroy is a publishing expert, futurist, and author. McIlroy has spent time in his career as a bookseller, a journalist, and a desktop publishing product manager, amongst other things. He is now an electronic publishing analyst, consultant, and author that explores the technology and marketing issues surrounding electronic publishing, books and digital magazines, publishing automation, and more. Glenn Yeffeth: Welcome to the Building Books podcast. I'm Glenn Yeffeth, publisher of BenBella Books and on this podcast we will talk about ideas, authors, and how publishing really works. Well I am thrilled today to have Thad McIlroy on. He's a publishing expert, futurist and author, who's been looking at the big picture and in the publishing industry for many years. I'm excited to talk to him about where publishing has been, where it's going. Before we get into all that though, Thad can you just give me a little bit about your background. The things that have shaped who you are today. Thad McIlroy: Oh sure Glenn. Where to start? I started in publishing right at the beginning of my career. Actually in book selling initially and then went into trade book publishing. I became from there, I worked for a while as a journalist. Then when the industry became digitized in the mid 80s, really initially with the Apple McIntosh laser writer, page maker, that sort of thing. It intrigued me to see an industry that I had known as a very analog industry rapidly digitizing and so I moved towards that and began consulting to publishers in the late 80s and since then have been a consultant to a broad range of publishing types over the years in Magazines, newspapers, ad agencies, designers all that. But increasingly my first love has always been and continues to be books. Most of my work in the last let's say decade has been directed towards book publishing specifically. Glenn Yeffeth: I came into publishing in 2001. Almost from the beginning I observed that everyone had a lot of trepidation about where technology was going, what the impact would have. One thing now that I've been in industry for 15 plus years, one of the interesting things to me is the things that didn't happen, one is let's just start with what everyone was talking about at one point, which was what happened to the music industry, in which a huge amount of the money of selling music just drained out of the industry. Am I right, that really didn't happen in publishing. Thad McIlroy: Yeah, that's an interesting point you raised. I spend a fair amount of time in trying to look at comparators between different parts of the let's call them the entertainment industry, from the music side to the book side, then the other one you have to bring into the equation is film and increasingly television or TV on demand and the Netflix kind of conception. You then try and see what are the differing forces and how do they compare? In what way are they similar and which ways not? I think what you're referring to, clarify if I'm getting this wrong, the amount of piracy in the music industry was so enormous and still is very significant, where book piracy has never been that big a problem, though many publishers fret about it publicly, there's just very little data to support that kind of concern. We probably have a hour discussion as to what it is that's unique to books that makes them less appealing to pirates. Glenn Yeffeth: Well part of it, if you look at the big picture and you look at the revenue from selling music, which drops just off the top of my head something like 25 billion to 14 billion. Now it's going up again because of streaming. But a huge amount of the total revenue of everyone, the people who sold music, that revenue dropped off a cliff. People were waiting for that to happen in book publishing, and maybe part of the reason is, you can't disassemble a book the way you can disassemble an album and people were paying 10 or 15 or more for a CD when they really only wanted three of the songs. Once they can get those songs for 99 cents, pray to the industry, I'm sure there's a million other factors. We were waiting for that to happen in books and it never happened. I was just wondering if you had some thoughts about the differences and the similarities lbw our industry. Thad McIlroy: Yeah, sure. When you say disassembling, I would say, "Yeah, that's one aspect of it if we try and do a corollary." You can take an album and break it into its songs. Those each stand alone or can stand alone, separate from the album experience, where with a book we have no transition of extracting chapters and trying to transact those separately. I don't see that as a primary way of seeing those two things side-by-side. What I think is the largest issue is the let's call it fidelity of the digital format. With music, and music that's digitized is perfect. Thad McIlroy: You can create a digital replica, particularly if you're talking about an analog version of that same music, it's better than, but there's no degradation inherent in the digitization of music. Whereas publishers in my view have really screwed it up in that the eBook formats remain significantly substandard against the print book format. While there are some advantages in eBooks, which are pretty easy to delineate there's still really significant aesthetic and usability disadvantages that I think have been a big part of the slowing of the uptakes of eBooks, pricing being another huge one. Just usability is a major factor. Glenn Yeffeth: That's very interesting. Is it the nature of eBooks or is it the way publishers have implemented eBooks? Thad McIlroy: The latter, not that it was easy and not that there haven't been a lot of smart people working really hard to create high quality eBooks formats. A combination of things, the current eBooks standard EPUB3 is robust, but most publishers done use it, they use an older version 2.0, 2.1, that version was less robust. If you used 100% of the features of that file format, you could do a pretty good job, but most publishers didn't bother. Most publishers have, I was going to say a contempt for the format. Thad McIlroy: It's the nature of the way this industry is set up. eBooks don't have the same kind of champions within a publishing company that the print books do. Publishers figuring now that it's becoming a spiral, the eBooks aren't selling enough as a percentage of the total sales. We're not going to invest extra money in creating better versions of the eBooks. Then the vendors like Amazon don't support all of the features in the eBook and ... They end up the losers are the consumers who just don't get as high quality experience as they could get if the publishers put more effort into exploiting the inherent features of the format. Glenn Yeffeth: I think I followed that let's say for a beautifully illustrated book that you could turn into an eBook. Let's just talk about a novel. Is a novel under-developed as an eBook? Thad McIlroy: Those are the best. That's where the greatest success has been is in fiction. One of the things I did years ago was actually the product manager for an automated book typesetting system. The first approach we took, "Oh, well fiction is so simple, we can just automate that typesetting." But interestingly even within fiction there are often interesting page variance. There are sometimes little illustrations in the text and interesting ... You'll see books where they author, like Kurt Vonnegut, was very famous for putting little sketches in his books, so those have to be rendered very carefully within an eBook. But you're right, the average book of fiction, the genre of fiction tends to be straight text, nothing fancy at all. Thad McIlroy: Yes, those are perfectly optimized for the whole eBook ecosystem and experience. As soon as you get into non-fiction, it doesn't have to be fancy, beautiful illustrated books or clever kids’ books or anything like that. It's amazing how the average book of non-fiction quickly deconstructs in the eBook format in unsettling kinds of ways. Again if the publisher has put the effort of matching the index against the pages and building certain of the visual elements with more gusto, we'd have a much better experience. But I'm constantly disappointed when I get a non-fiction eBook on my eBook reader or on my computer. Glenn Yeffeth: Interesting. I'm interested in thinking about that for our own publishing house. We actually for our full color books and for our illustrated books, we actually spend a lot of money working with top designers to develop the eBook. For a simple, we don't do a lot of novels, but for a simple just print books where there's no illustrations. We do them very straightforwardly. Maybe that's something for us to look at, so that's a great idea for me. Thank you. Thad McIlroy: I think you should talk, every publisher should be in touch with the people who are reading their books. Do more focus groups. I've visited your website, I've looked at some of your publications. I think you're doing a wonderful job. A lot of publishers aren't making the kind of efforts that you're making. Even when you do try hard, I think you'd be shocked by some of the responses you would get from the average person who's bought one of your books. Glenn Yeffeth: Another thing that everyone was worried about, maybe we're still worried about it. I'd be interested in what your thoughts on this. I think you've talked about this where Netflix. Reed Hastings is talking about, we're not just competing with television, we're competing with every use of the reader's time. If you look at the proliferation of all these new digital entertainments that people can access, you'd think there's a lot less time for reading. But when you look at it, it looks like especially when you factor in all the self-publishers and all those books being released. It looks like the number of books being read is at least flat if not growing or at least the number of books bought, nobody knows how many that's being read. First of all, is that observation correct? If so, how would you explain that? Thad McIlroy: Good, quick question really. It's a Heart of Darkness question. Let's go with the easy part of that, which is how is the book market? If it's so threatened why isn't it collapsing and it's not as you're correctly observing. With unit sales, dollar sales surveys of readership suggest that for the most part it's flat. Which is, given that so many of us were at one point catastrophists. It's great to see that it hasn't been catastrophic at all. It's hanging in there and it's a big market. Book publishing is a $35 billion industry in the United States. Thad McIlroy: In that sense there's cause for optimism, then moving on from the optimism, we would note that a market that's flat in a growing entertainment industry is the market that's losing. Netflix is growing leaps and bounds, music is growing once again, publishing is not growing it has not seen growth in about two decades. It's at a very I think fragile point of view. The next economic crisis that we face could have a very significant negative impact on book publishing because it is very recession sensitive in ways that certain other parts of the entertainment industry are not as sensitive. Then going back to what you started with there with Reed Hastings and Netflix, that part is completely intriguing, right? Thad McIlroy: We try and dissect 24 hours in a day. How many ... We work this, we commute that. There are these time use studies that are very robust in terms of the accuracy with which they try and track how people use those, the time and what they consume and the leisure time. It breaks down of course, let's say that the average person has four hours of time that they can devote to various entertainment consumption opportunities or digitization, texting with friends, other digitally enabled activities, it ends up adding up to far more than four hours because of multitasking. That's proving to be ... People are becoming more and more adept at multitasking. The thing that's least adaptable for multitasking is reading. You can't do much, you can listen to music. Thad McIlroy: Not much else. In that sense Netflix is going to do better than Simon and Schuster in this particular battle. Glenn Yeffeth: Right. There's something about reading, at least in terms of immersive reading. It's an experience that while it competes with everything, nothing really quite replaces it. It's its own unique thing and it has been for a very long time. Thad McIlroy: There's much truth in that, but I feel that others have commented, Netflix is so interesting. Really it goes back to HBO, the Sopranos would be the starting point of that where the intellectual sophistication of the content that started to come through the TV channel, I think rivals the intellectual sophistication of some of the best creative writing, whether fiction or creative non-fiction and its ability to engage the brain and fully capture the attention and imagination of the viewer. It's incredibly thought provoking and absorbing. That to me is probably the biggest threat to reading at this particular point. Netflix is an exemplar. Although I must say a lot of the stuff they do is so awful. I just don't know who is the audience for that. Glenn Yeffeth: I have to agree with your big point here, which is that we are in this golden age of thoughtful television, I don't know if you watch West World, but that's just launched up again. We've actually done, we have a series called Smart Pop where we do intellectual or semi-intellectual essays on different pop culture topics. We've done probably 20 books about different TV shows. We tried to put our book hook into the growth of great TV even as that's happening. Glenn Yeffeth: I totally [crosstalk 00:15:35] that. Glenn Yeffeth: Obviously I probably wouldn't be in this business if I wasn't an optimist. I have observed the staying power of books in a way that has shocked me. I'm thinking more now on a non-fiction side which is really our bailiwick. I think with the proliferation of digital information, of free information, that anyone can put up. There's more and more desire for curated information. When publishers talk about themselves as curators, I always roll my eyes. That's ancient history, maybe at one time, but now anybody can publish anything. But in a way that's part of the issue. Glenn Yeffeth: I know you look at the New York Times, they did a billion dollars in digital revenue and subscriptions in 2017 because I think in an age where anyone can post anything, there is a desire to have something that's authoritative. I find myself even though there's an infinite amount originally information on the web, I will want to get a book on a specific topic that I know is written by an expert. I know they put a lot of time and energy and the book was edited. To me I think that's maintaining the book, but maybe I'm too optimistic. What do you think Thad? Thad McIlroy: No. I think that can go on that one, then it's an increasing trend. I think anyone who's semi-literate or above, once you live through the internet experience for more than a year, two. You pretty quickly define that there are some real problems in terms of the consistency of the quality, even if you are selective towards the New York Times for example. The quality there, another recipe article, another travel article and so on. Those have always been there, but somehow they're more in your face via that medium. Yes, I think as you were asking that or making that comment, I thought one of the things that I'd noted in the history of publishing, speaking broadly, including multiple magazines, newspapers and visual media and so on. Quality has ultimately and quality is always a significant definable part of the market, however you define quality. Thad McIlroy: You're almost a niche publisher by focusing on quality, because a lot of publishers don't. Certainly that's what's happening with the self-publishers and where they are not competitive in the non-fiction sphere because they don't have the kind of resources that you can bring to bear. The kind of professionalism that's part of your organization. Consumers are going to spot that and are going to react to that accordingly. It's good to see. Another thing I was thinking of as you were talking, it's a great time to be a small publisher because you've got ... What to say, flexibility, the ability to react quickly to a trend, the ability to adjust a marketing program around a book that's encountering a different kind of marketplace than you might have anticipated. I think a good small press, it's never been a better time to be a good small publisher. Glenn Yeffeth: I agree with that. Even as the big publishers are starting to scale back or focus more on the A list books. It creates a lot of opportunities for a smart independent publisher. I've just seen it in my business how successful we can be because of the openings that the big publishers create for us. I've definitely seen that. Going back to what you said about the self-publishers, I do think that ... A lot of the self-publishers are producing great stuff, but because so much of it isn't very good, it's very hard for the self-publisher to signal, yes this is question quality product unless that person really has achieved some name recognition. That is still an advantage to even a independent publisher over a self-publisher. Thad McIlroy: Yeah, I spend a lot of time with self-publishers, I consult. Increasingly in my consulting work, often involve self-publishers. I have a couple of projects on now with some very ambitious self-publishers who have called upon me to help out. I know a lot of self-published authors of fiction and non-fiction. I've self-published myself and a number of non-fiction books, no fiction. I've definitely immersed myself in that side of the industry. It's intriguing because the dynamics of self-publishing arguably it's a different industry than what we call book publishing, it's just self-publishing industry. It has whole different set of forces that come to bear on it. Particularly in the way that quality is signaled as you mentioned and perceived by potential readers. The way that readers are reached and influenced is something fascinating in the self-publishing sphere. It is to think about something like Goodreads and how influential that is within the self-publishing community. Glenn Yeffeth: That's something very different than the influence of the New York Times. What advice to you give to self-publishers who really want to make business out of it be successful? Thad McIlroy: Despite my enthusiasm it's brutal. You know how brutal it is to be a publishing business, to be a single author trying to build an audience, it's grotesquely brutal. You have to be very, very brave. I don't think you want to be masochistic because that'll look after itself. You have to realize that the commitment you have to make, just throw any thought about money out the window. Just be focused on finding a relationship. Is there a readership. Is there a readership for your book and if so, how do you reach them? You're going to have to reach them one at a time at the beginning. That's painful and hugely time consuming and not a business model. Over time if you're willing to make that investment and do have a book that is of quality that readers read and do get delighted by, you have a chance. If your book is anything less than exceptional, you're going to have a near impossible task. Glenn Yeffeth: It's interesting, I've read a lot of the writings of self-publishing experts because I think they have fascinating things to say about marketing that we can learn from. I've noticed you alluded to there's a conflict between smart publishing for a self-published novelist and smart publishing for a independent publisher that's trying to get books in stores. Independent publisher or self-publisher might try to bring out a book every four months and write them quick, get them out. That's the advice that I hear a lot. It seems to make sense, you're building your audience. Each new book sells the one before it, but for somebody who wants to lay down in a book store, wants Barnes and Noble to get excited, it has to be a much different process. That topic is really there. Thad McIlroy: Yeah, I agree with you. You've pointed to a couple of intriguing things. The first thing I think, as you're talking about this. I was at a Romance Novelist Conference a few years ago speaking and got to meet some of the folks who were building big audiences in the romance field, smart, committed artists working hard to try and bring delight to their relationship and trying to be as professional as possible. They run to this expensive conference and share tips and tricks. I met someone, one of the novelists one evening and I said, we were talking away and talking about this issue of how many books you need to build your audience, you need more and more product. Let's say, "How many books did you publish in the last 10 years?" "Oh, I did three last year." Thad McIlroy: Three novels last year. They said, "Yeah. Yeah, I'm really starting to build a readership." So you're saying, "This is something different, this is not the publishing we grew up with. This is a different form of entertainment that uses words. The process resembles what we call publishing, but it's actually something kind of different. It's hard to at this point still define that exactly. Is it an industry that has to do solely with genre fiction and solely with series. That's as you say the advice is to get them out there quickly and build your committed group of readers because you're giving them enough new stuff per year. When you think, "Oh that's a really limited business model." Glenn Yeffeth: I've noticed in a lot of your interviews and writing you're a little critical of the big publishers. Sum it up for me, what do they get wrong? Thad McIlroy: Oh, what do they get wrong? I don't know that I would say they get wrong, I would say per se. I think they tend to be ... They're arrogant of course, which is the nature of the incumbent and that's never a good thing. That isolates them and causes them to make certain kinds of business decisions that are not necessarily ... If they could get off the pedestal and get down in the weeds a bit more often, they would probably certain different kinds of business decisions. The most vexing one and one I just Tweeted on it just before this call. The figures came out for 2017 eBook sales today down 10% in 2017. Of course that's just measuring the traditional publishers with that particular release because the self-publishers have some other way of trying to measure their output. Thad McIlroy: For the traditional publishers, the eBook sales are down 10%, that's ridiculous, right? They're down 10%, this is a fabulous industry. There are millions of readers, how could you possibly have allowed your income in this particular area to drop by 10% in 12 months. It's like the answer is pricing as we know. Prices are ludicrously high in terms of the quality being delivered. In terms of the mechanics of the market and how people respond to a digital product versus analog product and what pricing means on an opportunistic basis. There are studies that make it absolutely certain that if they dropped their prices they would pick up enough profitable volume to more than off-set the decrease in revenue that would result from those prices. However, they have a complex problem. Which is that they need to continue to support the retail ecosystem. As I see it Armageddon comes when Barnes and Noble finally throws in the towel. Thad McIlroy: It's hard to know when that's going to happen, lots of complicated things there. It seems inevitable at some point that there is no Barnes and Noble. Certainly not as we know it today, the superstores are proving to be an uneconomic format, the company continues to contract. When you look at the percentage of the overall book publishing business that's represented by retail, it's very modest, but it's essential. It's still essential for trade publishers to have that opportunity to get into the retail channel in terms of discoverability, credibility, reviewers taking, paying attention to books and building a readership and so on. Until that day, part of it collapses upon itself, it's very hard to be a large publisher. Even I'm sure for you with your publishing company, you've got these very mixed signals that you get around trying to support the retail ecosystem. Glenn Yeffeth: At our size that's above my pay grade. I don't think Barnes and Noble is depending on us to keep them afloat. Thad McIlroy: One of the things that keeps the big publishers, let's say the top five, what keeps them alive, a significant factor that's under-reported is that they monopolize the review space, the book review space and increasingly monopolize it. I study the bestseller list, but more often also what I study and I think is more telling is the book prizes. The prizes go far disproportionately to the books from the big five. I keep looking at it saying, "Is it possible that there was no non-fiction book last year from a publisher that wasn't the big five?" That should be on this list of nominees. How can that possibly be? Thad McIlroy: You see that the attention that those people can still garner with their books, they have a stranglehold because if you're using the New York Times as an example, LA Times Book Review, whatever, it doesn't have to be New York Times. I don't dare not review the books that those publishers signal as being important. The question is how do you break through that noise and get reviewers who have an audience of serious readers to look at the books, the important books that you do. Glenn Yeffeth: That's a great question. We're in the non-fiction space. I think it's very different in fiction, which is much more review driven. We've had 14 New York Times bestsellers. Many books selling hundred thousand plus copies, one selling a couple million copies. Never got a New York Times review. I think it would be great, and we go after reviews and we get some. The Wall Street Journal have been good to us for whatever reasons, so we do get some coverage. I don't think most non-fiction books are selling on reviews. I don't think it's that big a factor and even less, prizes. We've won some prizes it doesn't always sell very many books. No we haven't won a book or prize or any of the ...Even those if you look up on BookStand, the book or prizewinner, a lot of them don't sell that many copies. Glenn Yeffeth: Non-fiction publishing is inherently a niche business. There's Fire and Fury and the Comey book. There's always a few examples that are go beyond it. But there is maybe half a million people that's your targeted market for a book. If you get to 10% of them, you've got a nicely successful book. If it blows up beyond that, then you've got a really big book. We've had a lot of very successful books that don't get the attention of the review space, I don't think it matters that much, especially in a niche business. There are people with a 50,000 person email list that sells more books for us than when we get the same author on the Today show. It's just a niche business. These generic reviews are not that powerful in our experience, which isn't to say we wouldn't love to get more of them and we don't try. It doesn't make a big difference. We get publishers and we get reviews of course, it doesn't sell a lot of books. It doesn't make a big difference. Glenn Yeffeth: We use the quotes, we try to leverage it, but it's not even a big factor is getting laid out. It's a different world. Those reviewers, they have a role, but not that big of role in the big picture in terms of [inaudible 00:31:39]. Thad McIlroy: Good. Good. That's interesting. Glenn Yeffeth: Just to have a little fun here. Let's say some investors came to you and said, "We like the way you think. We want to fund you and have you start off an independent publisher." You said it's a great time for independent publishers, let's start out Thad publishing or Mcllroy Press. How would you focus your effort? You were given some money and you wanted to start a publishing business would you say, "No thank you." Or would you say, "Okay, here's how I would do it." Thad McIlroy: That's fun. That is a fun question. I'll tell you the most recent, actually in the last week I've been talking to a couple of friends about starting a new publishing company. Here's how I described it. I said, "All the books will be printed letter press so that they're beautifully produced, not as art objects, but just beautifully printed books. So that when someone picks them up they go, 'This is a lovely object, I really look forward to reading it.' They'll be expensive, instead of being 25, they're going to be 50, but they won't sell anyway, so they might as well look good." That was my ... I don't think that'll be approved. Glenn Yeffeth: Yeah, I don't know if you could get a lot of funding with that idea. We started out, we've come strayed away from it, we've pivoted. But we started out as a science fiction press and doing a lot of reprints. I've noticed that in the science fiction space for some of those classic books or some of the big name books. There is money to be made selling 50, $75 limited signed editions of some of the big name books. That's of course even a separate category of rights. You might not be crazy with that idea, you just have to have Stephen King and some of the ... You may be able to get those rights because that's not a right that's typically exploited by the big houses. Especially if the author wants it, which generally for ego, they would love to have that. I think I could put some money behind this idea. It could be a good idea. Thad McIlroy: We'll talk about it. The other one that I considered, given a lot of thought to, but have never brought to fruition. It comes to back to the earlier part of the conversation, eBook formats. As a publisher if you mastered how to do the format, consistently beautifully, maximized all of the things it can do well versus print books. There's certain things that digital can do better. There's lots of things that print does better that digital can't touch. Its not one or the other, but to work with eBooks to their maximum capacity and try and build a press that just does consistently ... With the print book we wanted to write ... The customer, the reader, we want when they pick it up, you want them to say, "Wow, this looks great." Thad McIlroy: I see publishers competing with digital are wonderfully focusing much more attention on production values in the last five years ago, which I had been preaching and pleased to see that happen. With eBooks we haven't done that, most publishers are not trying to delight their readers. They have this view that it's a secondary format. Well what if it was a primary format? What if we really started thinking digital first in a profound way, what kind of publisher would that look like? That's the other side of it for me. Glenn Yeffeth: That's interesting. We definitely don't think of digital as a secondary format, it's co-equal to the print side and it's an important part of our business. I wonder if a lot of the publishers have been burned on the apps, if you remember every publisher was going to get into apps and some of those apps were gorgeous. They were amazing and nobody bought them. I wonder if the reason no one may be no one is thinking of spending a fortune on doing amazing eBooks, because one there's all those technological limitations you talked about, including the ones set by Amazon. But also it's the fact that we've been down this road before and it didn't work out too well. Thad McIlroy: That's a good point you're raising. In one of the books I wrote, one of the market studies was really looking at market opportunity for book publishers in the app space at the point when we were all thinking there was an opportunity. I interviewed some of the publishers that were putting the big money into that like TouchPress in the UK and gosh, TASCHEN in Germany and so on. There was people that as you say they spent a lot of money and didn't get it back. The problem with the apps was audiences aggregate to one source or to the top source, the blockbusters. People look at what's happening now in the app space, because that roughly 90% of the time is spent with 10 apps. That was always problematic, but it's only gotten more and more concentrated. I don't think people should see that as a reason not to do more things with eBooks. Glenn Yeffeth: Right. Actually if you look at the book business, most of the revenue is from a small number of books as well. Most books aren't very successful. Glenn Yeffeth: Oh no question. Glenn Yeffeth: Thad, let's go back to what you were saying earlier, which I found very interesting about ... Because I hadn't thought of this before and I know it's not part of my awareness. You were saying that perhaps the big publisher has over-priced eBooks as a way of supporting the retail channels, Barnes and Noble in particular. You have to argue that if that's the case, there is a really business logic of doing that isn't it? What's the world look like when let's just say if Barnes and Noble is gone and it's really Amazon, plus a bunch of independents and a little bit at Sam's Club and what have you? Thad McIlroy: It looks way different doesn't it? You pointed two things out. One is a particular analysis that we bring to bear on what happens when the retail ecosystem collapses and its impact go far beyond the strictly the sales dollars that, that portion of the industry produces. It has a disproportionately large impact beyond the sales. This is the other thing you're pointing to there, which is really an issue that's under-explored and very controversial is Amazon's dominance. Thad McIlroy: It's not like no one talks about it. People think about it, talk about it, it gets written about endlessly in books and many other areas how dominant Amazon is. When it comes to book publishing, their dominance of the retail channel is so extreme that it's terrifying because it undermines the entire industry, because we cannot be dependent on a single outlet for our success or failure. For many of the publishing clients I work with now, if they can't make it work with Amazon, they can't make that book work, the whole thing falls apart, that's not a good business. Glenn Yeffeth: For an independent publisher like myself where like I said, it's above my pay grade to worry about the industry configuration issues, it's just too big for us. But for us, Amazon and the other retailers are the ecosystem which we have to survive. If there's only ... If Amazon is increasingly dominant, then that's the ecosystem in which ... I can't fight Amazon and I don't want to try. I have to be better than my competitors in flourishing in the Amazon ecosystem. Thad McIlroy: Yeah, you do. Glenn Yeffeth: But the long-term challenge is, I don't know if Amazon has a plan to disintermediate the publishers, but I'm pretty sure they wouldn't mind doing it. If Barnes and Noble is gone, then the argument that a publisher presents to an author is a lot weaker. Thad McIlroy: That's well put. That's really well put. Are you referring to Amazon's own publishing program and how it's taking an ever increasing total percentage of the total book sales on Amazon? Glenn Yeffeth: That, plus their facilitation of self-publishing. Because I'm in a non-fiction space and I work with a lot of authors with a great platform, they are always thinking about self-publishing. I try to make the case to them that, not always but they are often thinking about it. I have to make the case to them that they are better off with us than going on their own. Part of that case, the big part of it is retail distribution. Glenn Yeffeth: Another part of it is marketing, which I think a lot of publishers, it's not their strength. For us it is a strength so it's something I talk about a lot. Is it enough of a strength to win in that market where all of a sudden no one cares about retail distribution anymore and 90% of sales are online. Glenn Yeffeth: That's going to be a much tougher conversation. Thad McIlroy: It is. A tougher conversation, a couple things there too, the retail market is not complex. You have access to it and a self-published author does not is really the single factor in terms of being successful within the retail market. That's a deep arced problem. It's very easy to understand what the opportunities are and what the limitations are of the retail market. What's not a deep arc problem is how to be as you've put it a minute ago a more successful publisher on Amazon than your approximate competitor who's doing books similar to yours, and similar topic range, similar quality. How would you out perform them on Amazon? Thad McIlroy: That's a far more challenging problem than how do you out compete them in Barnes and Noble. On the other hand because it's so complex, it doesn't necessarily appear. People don't understand the level of complexity involved. The level of complexity involved in being an excellent digital publisher, so you're going to lose some authors who say, "Oh, I can do it myself." They'll probably come back after one book in many cases. It will be the way they go out of work and that's fine. The one thing we don't have a shortage of is raw material. There's always going to be other authors that you can fill the space with. That's not going to be problematic from a business model perspective. Glenn Yeffeth: No, that's right. It's a question of whether it becomes a tipping point. We have a number of self-published authors who we took in. They'd sold five figures of their book and we turned that into six figures. We know from experience that we can add a lot of value to a successful self-publisher. Part of that equation is retail distribution and I do think there could be a tipping point where if enough people decide, "Hey, I don't care about retail," that becomes industry dynamic. Then we're seeing publishers really having to buy the product through advances or some other means that of adding value, that was not where we focused, which was more distribution and marketing. Thad McIlroy: Interesting. You know this better than I do. On the one hand, I think that as publishers, the print format, I think we've now studied it enough. We know that for so many kinds of books, print is the superior output medium than digital. There's no reason to think that will stop happening with a great many kinds of books. Even if the retail channel as we know it now does a radical shift, I don't think it disappears. The value that you bring in terms of mastering that channel or maintaining that channel, again I don't think that will ever become accessible to the average self-publisher. You're going to continue to have a competitive advantage there. But I also would continue to argue that it's the rare self-published author who really rocks how the levers and knobs and levers of self-publishing, promotion, and distribution, success really works. That's something that you clearly do understand, and that's a sustainable competitive advantage. Glenn Yeffeth: That's interesting. I think you do have a point and for us it's always a focus on marketing. Glenn Yeffeth: Because that's the toughest part of the business in a way. Glenn Yeffeth: For us the break is always, it's not in digital versus print, it's been online versus book store, because that's where I think there really a different skillset. Let me shift the topic because I wanted to ask you about something else. I know you've done a lot of research into book publishing start-ups. Glenn Yeffeth: I've looked pretty casually at a lot of the start-ups coming in and out of the space. My observation, which might be naïve. You might want to correct it. My observation is they've had very little impact. The start-ups haven't changed much of anything. Am I right or am I wrong about that? Thad McIlroy: You're right. Completely right. The study that I published last year on start-ups, which I looked at over 800 of them. One of the data points I had was how much money have been invested in these companies, and it was under a billion dollars, which is nothing. In 800 companies, it was well under a billion dollars. I can't remember the number, but it was chump change in terms of the kind of money that flows around the start-up community. So they'd not been successful in attracting capital, which is chicken and egg of course to some extent. It's because you would say a lot of the investors have not appreciated the opportunity that's there. No, actually the investors have looked at it very closely and realized there isn't an enormous opportunity there. Then you start to say, "Well, does book publishing need to be reinvented?" It's like, "No, actually it works just fine." There are shifts. Thad McIlroy: We figured out how to publish books and get them to the readers who are interested. The reinvention has to be going beyond the book. I think I could make this a philosophical, if we call it that argument that Netflix is the best book publisher in the universe, but they happen to do their books as moving images. It's that kind of rethinking that need to be ... If you're thinking about the future of publishing, you need to have that lateral rethinking, it's not about an incremental change to the business model and the outputs that we have today. Most of the start-ups that have come into this are very ... They're self-centered and unimaginative at the same time and really aren't bringing much in the way of new thinking to what's going on here. Glenn Yeffeth: What about subscriptions, do you see a future in that? Glenn Yeffeth: Didn't he come up with long tail as an idea? Thad McIlroy: No, that was Chris Anderson. Glenn Yeffeth: Oh that was Chris Anderson [crosstalk 00:48:09]. Thad McIlroy: Kevin anyway, says the way he describes it, you start to think, "Yeah, it's got to be, right?" Because with music as we're seeing with Spotify and the transformation of that industry and with Netflix. It's like, "I don't need to own these things. Why would I own them anymore? Why would I own a CD, why would I own a digital file let alone a CD? Why would I own a DVD? Why would I own the digital file of that particular film?" They still try and do extras and this and that, so there's certain issues there. Broadly speaking with the average piece of entertainment product if I can use that word. Thad McIlroy: I disagree with that. Glenn Yeffeth: How do we get there from here? Help me understand that. How do we get there from here? Thad McIlroy: It ain't easy. When you see the publishers controlling, indeed they do. They're going to go down, the kicking and screaming is going to be the least of the noise. It's going to be much louder than that. There is a huge logistical problem in terms of the legal contract. That's a huge logistical problem that we ran into with subscriptions 1.0 a few years ago when we had those start-ups like Oyster that came and went. Oyster is quite well funded. When your start-up is saying, "It doesn't matter what the customers want." Well it does. You look at two forces right now in the short term. Of course there's Kindle unlimited on the Amazon side and Scribed on another side that's starting to have some success in book subscriptions. Thad McIlroy: Alternately in the non-fiction space albeit a niche, but still very interesting is what O'Reilly's done over the years with Safari and the tremendous success they've had. Going back to using a Kindle Unlimited is the most intriguing thing to me because it's become a thing for a self-published author not to go into Kindle Unlimited is a mistake in most cases, certainly for fiction, for non-fiction that's a different thing. But if you're a fiction author, not to publish your book through Kindle Unlimited is a mistake because you're missing a significant amount of income. That's a subscription based eBook service. What it does, you're not allowed to publish with a else. Apple, Barnes and Noble, et cetera when you're in Kindle Unlimited. Thad McIlroy: They monopolize that part of the market and they create a whole sector of the reading market that's serviced by subscriptions. If you're a publisher for getting your company [inaudible 00:51:03]. You say, "Well I don't want to be in that monopolist's channel and I don't want to miss being able to market through Apple, for example which is potentially a robust channel, but they've screwed that up about every way they can. Then you start to say, "Well, okay there's publishers who are going to remain outside that channel eventually are going to be dragged into it." They're going to be, their authors are going to say, "Please, I'll sign a new contract. I want to be in those channels." That's what I see happening over the next decade. Glenn Yeffeth: That's interesting. If it does happen, I think Amazon has the best shot at it because they're the only ones who can really put the pressure on the big publishers to cooperate because the front list titles have to be in it or it doesn't really make sense just to add on [crosstalk 00:51:50]. Thad McIlroy: No. Because there's significant numbers of millions of subscribers to these services that when you say Amazon can put the pressure on the publishers, it's not going to be that it's going to be the carrot, not the stick. That's what Amazon is doing is they're making it really a very appealing carrot. That's ultimately going to be ... There's going to be this viable channel that by all means skip it. You don't have to bring your offer to this channel, because people are finding they don't need to have those books, which is increasingly the case, right? The blockbusters are selling fewer and fewer, there's a part of the changing dynamic because people are finding there is an alternative to everything but Fire and Fury. There wasn't ... The stuff at the very top of the heap has a unique position that can't be assailed. A bestseller 10 spots down the list can be substituted for as I'm sure you see. Glenn Yeffeth: That's a good point. It'll be interesting to see how that unfolds. Thad McIlroy: Yeah, very interesting. Glenn Yeffeth: My final question as a futurist in this industry, I'd love to get your big picture thought on where things are going? What's going to be different three years from now? Thad McIlroy: I'm fixated on the economy. It's been a decade past the last major downturn. I know I've got this emotional predisposition to disaster because of the way I grew up, which is a whole separate story. I'm the voice saying here at this fun party we're having with this incredibly strong economy, watch out, things are about to go down. When's that going to be? No fool can claim to have that answer. But I think any fool can say with pretty much certainty that it's going to take another turn. The effects of that when you analyze or research the history of recessions and depressions on these industries, they cause a significant reconfiguration. Thad McIlroy: Most recently we saw it actually in the printing industry, which was beginning to suffer for the recession of 2007-8 and was really just blasted by that. They were already in a problematic situation and that then came in. The winds were too forceful at that point. Book publishing, it's precarious. I say to my friends and my book publishing clients, "Build a war chest because the war is coming." If you're running lean and mean that's good, pocket some of those profits and think about ways that when things start to go southward, plan that business model now because that's the biggest challenge in the immediate future. Beyond that, just become a far better magician of these very complex things that you can begin to harness or to increasingly harness to get the word out to that one more reader that is going to be your friend in bad times as well as good. Glenn Yeffeth: Well thank you for that. I'll share one thing on that, which may or may not be a ... It's from a selfish point of view. I've observed that in the last downturn, 2008-2009, was very good for us. I bet it is for some other independent publishers because publishing is not like a lot of other businesses, in a way we're investors, we're almost like we're picking stocks. If the stocks are under value, then it's a great time to buy. One of the things that I see when the industry in general goes down, there are some tremendous opportunities to invest in authors and manuscripts that might not be available when the industry is flush. For a scrappy independent publisher like us, sometimes there's a bright side to when things are looking down a bit. Thad McIlroy: That makes a lot of sense and that's a good perspective. Again it's because you're scrappy, because you're small you can move that ship in those difficult times, which big publishers are just not ... It's well established they're not able to move the ship with anything like the kind of speed that you can do. Good, most of that is opportunity, people are going to ... Sales will drop during the next ... For the industry as a whole, but the smart smaller publisher, yeah wonderful opportunity. Glenn Yeffeth: For the record I am for continued growth and upturn, so I'm not routing for it. We'll be prepared I hope for whatever comes. All right Thad, this was great and I really appreciate your time. I really found this a fascinating perspective on the industry. Thad McIlroy: I enjoyed it. Thanks Glenn. Glenn Yeffeth: All right. Have a great day. Glenn Yeffeth: Thank you for listening to the Building Books podcast. If you enjoyed it please leave a review iTunes where we'll be happy to listen to it or hear it on social media. If you're an author who wants to submit a proposal or pitch to BenBella Books, please go to BenBellaBooks.com, click on the for perspective authors button. It'll lead you through a little form that makes it real easy to send to us. Thank you.